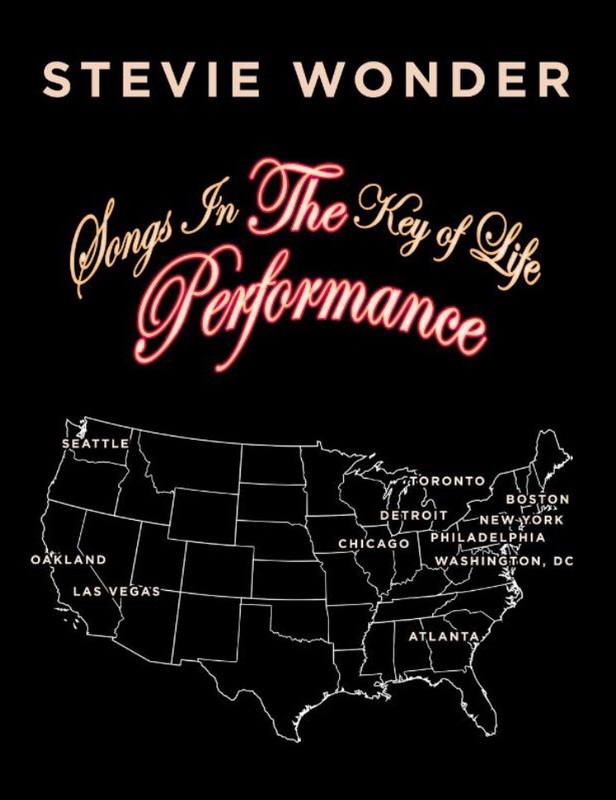 A Review of Stevie Wonder’s Live Concert Performance of “Songs In The Key Of Life” – the Album! This is my review of Stevie Wonder’s live sold-out concert performance of “Songs In The Key Of Life” – the legendary 1976 album on Tamla/Motown records, which is still considered one of his best and a classic to this day. Not many albums are so rich in musical depth that a whole concert can be devoted to them, but this is clearly one exception – and I was blessed to be able to witness this legendary artist perform it live in November 2014 (I’m copying this from a Facebook note I wrote at the time of the concert). This is a long write-up, so I beg your indulgence in advance. This may also explain the only annoying part of the concert: the lady seated directly behind me who kept shouting for him to sing “You Will Know” after about five or six songs into the set. “You Will Know” was not on the “Songs…” album, and even if he were to deviate from the premise and perform unrelated songs (which he did at the end and I’ll get to later), I can’t imagine the crowd really getting up for that one. However, I’m sure she wasn’t the only one who left the show with that (or similar) unfulfilled song expectations. But I digress…the show was nearly three hours of pure music (interspersed with Stevie’s comical banter…who knew he had such a sense of humor?). He provided funny commentary on everything from baby rumors to his Motown recording contract signed by his mother and Berry Gordy in 1966 (when Stevie was 16) and jokingly not expiring until 2017 (at which point he would finally be able to see). The 3-hour length (with no opening acts) is almost unheard of in concert performances today. Stevie’s vocals were in top form as he sang each and every song in their original keys while hitting nearly every note perfectly – surprising considering the nearly 40 years that have passed since he recorded them, but not so much so when you consider the perfectionist that Stevie was known to be both then and now when it comes to his music. The show had the added bonus of Stevie introducing us to two of his younger sons (who as a token played tambourines) and his daughter Aisha, the baby girl whose cries we first heard on the album’s classic “Isn’t She Lovely.” Let’s just say she’s all grown up now (curves and all) and served as one of the three main background singers on most of the performances. Those ladies were flawless, particularly when they were brought to the forefront to trade lead vocals on the female “reply” part of Stevie’s “Ordinary Pain” (yep, I know, another less familiar track to casual Stevie fans). This trio had all the sass of the original vocalist and did her full justice. Musically, Stevie’s band was simply outstanding, with a full 10-piece string section (conducted by Greg Phillinganes – a noted musician who also performed on the original studio album), a complete brass session, keyboardists, guitarists, bassists, three full drum sets, a percussionist, a ten-member backing choir, another set of background singers, and Stevie himself at various pianos, synthesizers and keyboards (and, of course, harmonica)! For good measure, he had the familiar R&B singer, India Arie, perform as a special guest – and she shared lead vocals with him – seemingly only to give his vocal chords a rest from time to time. She really didn’t add to the show’s overall success and, in fairness, she didn’t detract much from it either. In other words, she was used sparingly and it seemed like she was just there for the ride. At one point, she provided fodder for the blind legend to comment on how good she “looked” in her white dress, which drew laughter and applause from the crowd. The most successful (and arguably the most familiar) songs from the album, “I Wish” and “Sir Duke,” occurred very early in the show’s set (they were tracks 5 and 6 – out of 21 – of the album’s original sequence), so those expecting the show to be a radio-hits-filled extravaganza after hearing those two were likely disappointed when they realized that the only other songs from the landmark album that really got decent airplay back in the day were “Isn’t She Lovely,” “Knock’s Me Off My Feet,” “Another Star” and “As” (or the song that many people know as “I’ll Be Loving You Always”). “Pastime Paradise” is also familiar, but primarily because the ’90s rapper Coolio sampled it for “Gangsta’s Paradise” nearly 20 years ago and brought it to a whole new generation. That’s still a lot of popular songs for one album considering 1976 predated the post-“Thriller” era 1980s and ’90s when many albums were chock full of hits. Speaking of which, in a completely unexpected but crowd-pleasing departure during the show’s second half, Stevie launched into a seemingly impromptu tribute to the late Michael Jackson with a rendition of “The Way You Make Me Feel.” Even India Arie looked surprised as she jumped up and down in pure joy with the crowd dancing along. But perhaps Stevie’s best performances were of the less familiar album tracks. “Love’s In Need Of Love Today” opened the show (and the album), and was followed by “Have A Talk With God” and “Village Ghetto Land.” He did those songs justice as well as other non-radio tunes “Summer Soft,” “I Am Singing,” “If It’s Magic” (sung to the original music track in honor of the late harpist with whom he recorded it because “no one else could ever get it right”), and the socially conscious “Black Man” (complete with the tutorial history lesson at the end). He and his band expertly performed the instrumental tracks “Contusion” and “Easy Goin’ Sunday,” reminding us that Stevie’s vocals didn’t always have to grace a song for it to be considered ear-candy. The most underrated song on the album (in my opinion) probably got the most memorable treatment. “Joy Inside My Tears” is a slow-building, but rousing number that Stevie Wonder took to new heights with his performance. His vocal ad-lib at the end was true to the original and instilled new life into it. Admittedly, it was the song I always skipped when I played my mother’s copy of the album as a child because I thought it was just too slow and boring, but now it’s the one I go to the most! Now, for all those fans in attendance who were expecting him to go beyond this album and give us more of his catalog, they were likely pleased when he segued from “Another Star” (the 21st and last song of the “Songs In The Key Of Life” set) to a medley of his other hits. Needless to say, he left us all wanting more after teasing us with what was only a small fraction of the many dozens of hits he’s had over the past 50-plus years, but the show’s original promise – a full performance of the legendary album “Songs In The Key Of Life” – was more than fulfilled! It was fulfillingness’ first finale. Oh wait, that was a different Stevie album title! Definitely one less item on my bucket list!!! Posted on March 10, 2015 December 6, 2017 Categories Featured Artists, Live Music ExperienceTags Aisha, concert, Contusion, I Wish, Indie Arie, Isn't She Lovely, Love's In Need Of Love Today, My Cherie Amour, Pastime Paradise, Sir Duke, Songs In The Key Of Life, Stevie Wonder3 Comments on A Review of Stevie Wonder’s Live Concert Performance of “Songs In The Key Of Life” – the Album!